Buy OnlineGet started with Help+Manual now and unlock your trial version within minutes! Create Qt Help from any HTML Help/CHM file! Qt is a cross-platform application framework for developing application software that can be run on various software and hardware platforms. The Qt help system includes tools for generating and viewing Qt help files. However, all of these tools are command line tools. This means that although you can use your favorite HTML editor to write the documentation, you need to manually craft additional XML configuration files, a table of contents and a keyword index, to build a Qt help file. In contrast, Windows HTML Help (.chm) is a mature online help format that has been used by thousands of Windows applications for almost 20 years. HTML Help is very similar to Qt Help and there are plenty of tools available – both free and commercial – for authoring and generating compiled HTML Help. Much legacy software documentation is also already available in the HTML Help format. All this makes the ability to convert HTML Help to Qt help an attractive proposition that can save you a lot of time and unnecessary work. That is where QtHelpConverter comes in. 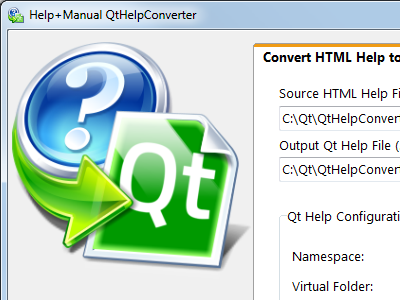 QtHelpConverter takes a compiled HTML Help/CHM file and outputs Qt help (.qch). Note that this application is not an authoring tool, it just converts a finished CHM help file to a corresponding Qt help file. If you are looking for a tool for creating and managing your documentation and user manuals, we recommend Help+Manual, since that is our help authoring suite. You can use any of many other authoring tools to create your CHM files if you wish. All you need is a finished, compiled CHM help file that conforms to the Microsoft HTML Help standards. QtHelpConverter will then convert it into Qt help. 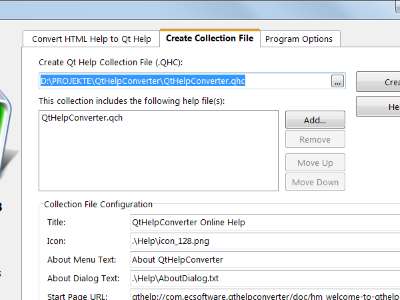 QtHelpConverter extracts HTML files from CHM and builds a Qt Help file with 1 click. The converter has a command line interface for integration in Help+Manual and into automated build tools. The Collection File Tool helps you to easily configure the mandatory help collection file. So first you need to create your CHM file. That part is up to you. 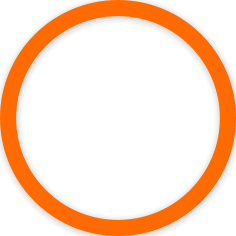 Once you have that, download QtHelpConverter and we can get started! 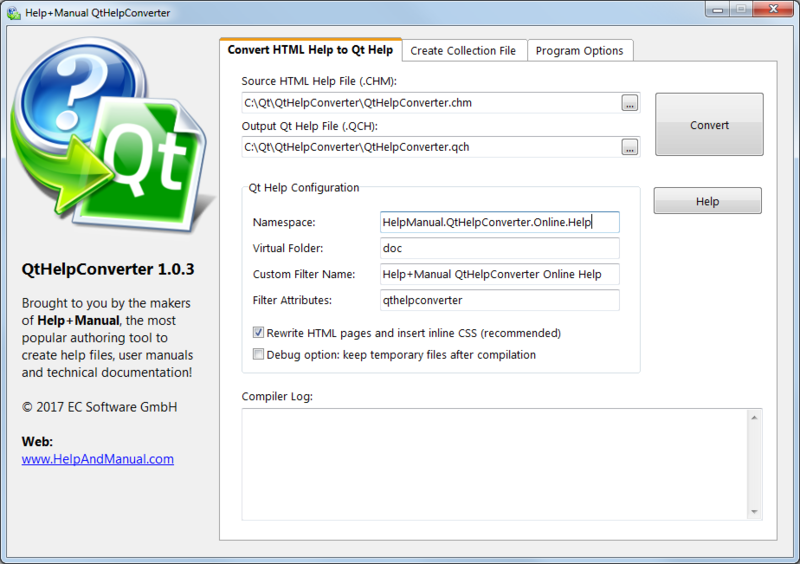 QtHelpConverter is free for private and commercial use.